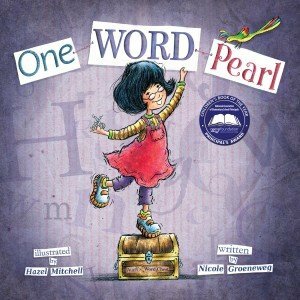 One Word Pearl, by Nicole Groeneweg with illustrations by Hazel Mitchell (Mackinac Island Press/Charlesbridge Publishing, $17.95, hardcover; $7.95, paperback, Ages 5-8), is reviewed by Cathy Ballou Mealey. 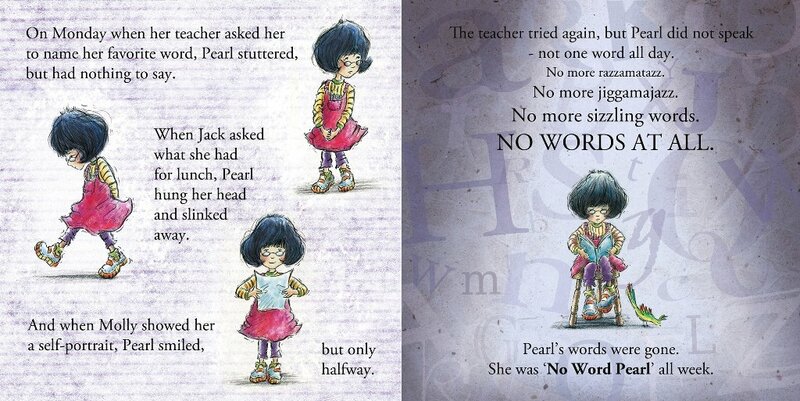 One Word Pearl is written by Nicole Groeneweg and illustrated by Hazel Mitchell from Charlesbridge Publishing, 2013. One of my favorite words is SCRUMPTIOUS. I also like DAPPLED, LUSH, and EXTRAVAGANZA. Although none of those are words that young Pearl collects, she does have some super selections! Floppity, poppity. Pizzazz, sizzled. Noodles, doodles. The words Pearl chooses and uses are fun to say. But she must ration them carefully after a windstorm swirls through her treasure box filled with clipped words. She squeaks through the week one word at a time until the words run out. After days filled with long silences, Pearl must summon her courage to regain her marvelous vocabulary. 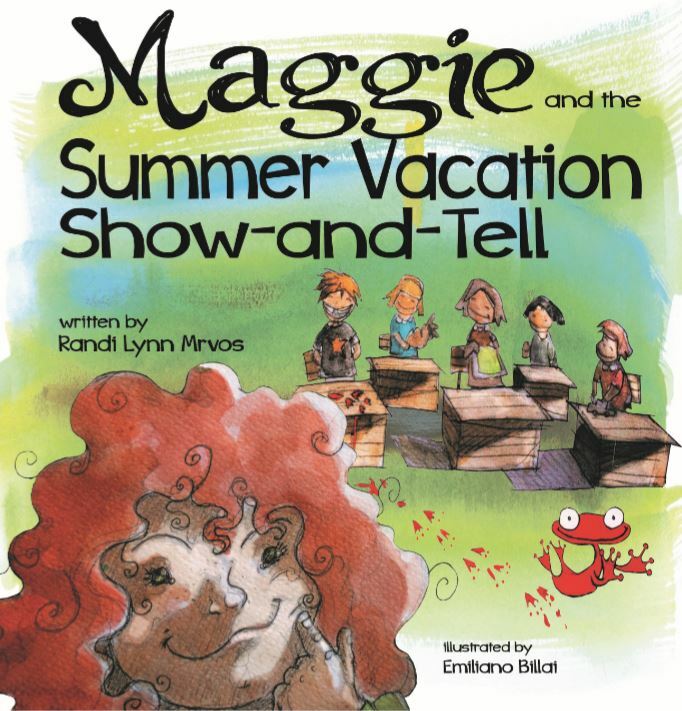 The rhythm of the snazzy synonyms and vivacious verbs makes this story a delight to share. What truly makes this story sparkle are the multilayered words, clipped and placed throughout the illustrations that are softly torn, crumpled and shaded for texture. Pearl also has a feathered friend, a brightly colored bird, who isn’t named in the story, but is a delightful addition for young readers to search for on each page. This imaginative tale will captivate children and parents who appreciate spoken words as well as words on paper, and encourage their creative use of language to express and describe. Nicole Groeneweg’s One Word Pearl with interior spread illustrations by Hazel Mitchell, Charlesbridge Publishing, 2013. 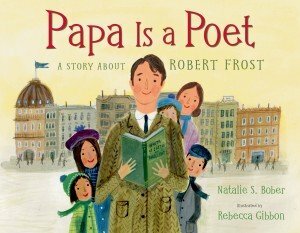 Papa Is a Poet: A Story About Robert Frost, by Natalie S. Bober, illustrated by Rebecca Gibbon (Christy Ottaviano Books/Henry Holt and Company, $17.99, ages 4-8), is reviewed today by Cathy Ballou Mealey. 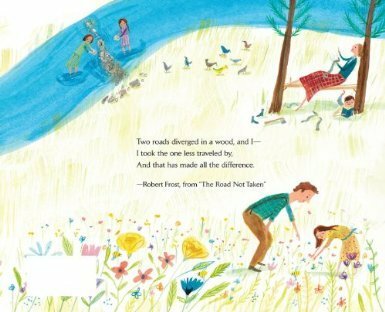 Papa Is A Poet: A Story About Robert Frost by Natalie S. Bober with illustrations by Rebecca Gibbon, Christy Ottaviano Books/Henry Holt Books for Young Readers, 2013. Sometimes it’s easy for a child to describe the work that their parents do for a living: firefighter, mail carrier, farmer. What can you say to describe that work when your father is a poet? Through the eyes and words of young Lesley, this charming book tells young readers what life is like as the child of poet Robert Frost from 1905 to 1909. The dramatic opening spread shows the tiny Frost family debarking from a looming ocean liner onto a barren New York City dock. The parents and four children are clutching old-fashioned trunks and carpet bags, ready to begin an adventurous new life on a farm in New Hampshire. As the story unfolds, the family works, plays and learns together while Frost struggles to earn a living as a poultry farmer. He tends to farm chores at midnight so he can read and write “in the hush of a sleeping household.” During the day the family picnics, hunts for flowers, and watches sunsets. At night they share stories, read, and stargaze. Through all the activity, Frost is a loving husband and father, teaching his children to observe the world with care and write down their thoughts, dreams and impressions. Interior art by Rebecca Gibbon from Papa Is a Poet: A Story About Robert Frost by Natalie S. Bober, Christy Ottaviano Books/Henry Holt Books for Young Readers, 2013. A young reader need not be familiar with Frost’s work to appreciate his deep passion for poetry and words. Lovely excerpts from his poems are sprinkled carefully throughout, and twelve complete poems are contained in the back pages. The charming illustrations pace this book smoothly with warmth as well as detail, offering delightful glimpses into turn of the century life. This book is a treasure to be savored slowly and repeatedly for all those who love the magic of beautiful words read aloud. The Snatchabook: Who’s stealing all the stories? The Snatchabook, Who’s Stealing All The Stories? by Helen Docherty with illustrations by Thomas Docherty from Sourcebooks/Jabberwocky 2013. What’s not to love about a picture book that conveys a heartwarming message about bedtime stories and the simple joy of reading together? In The Snatchabook, (Sourcebooks/Jabberwocky, $16.99, ages 3 and up) by Helen Docherty with illustrations by Thomas Docherty, a book I’ve seen on bookstore shelves everywhere I go, readers will be immediately pulled in by the images of animal families settling down for the night in warm, glowing rooms. Welcome to Burrow Down, invitingly depicted by T. Docherty, a quaint forest community dotted with cozy tree hollow homes, mole holes and rabbit warrens. Nighttime is a special time to hear all sorts of tales, a time when children are ready to let their imaginations soar. But suddenly all the bedtime books begin disappearing right before everyone’s eyes. H. Docherty wastes no time in setting the stage for a great mystery, though a subtle clue is given in the second spread (hint: look near the moon). Who is stealing all the stories? 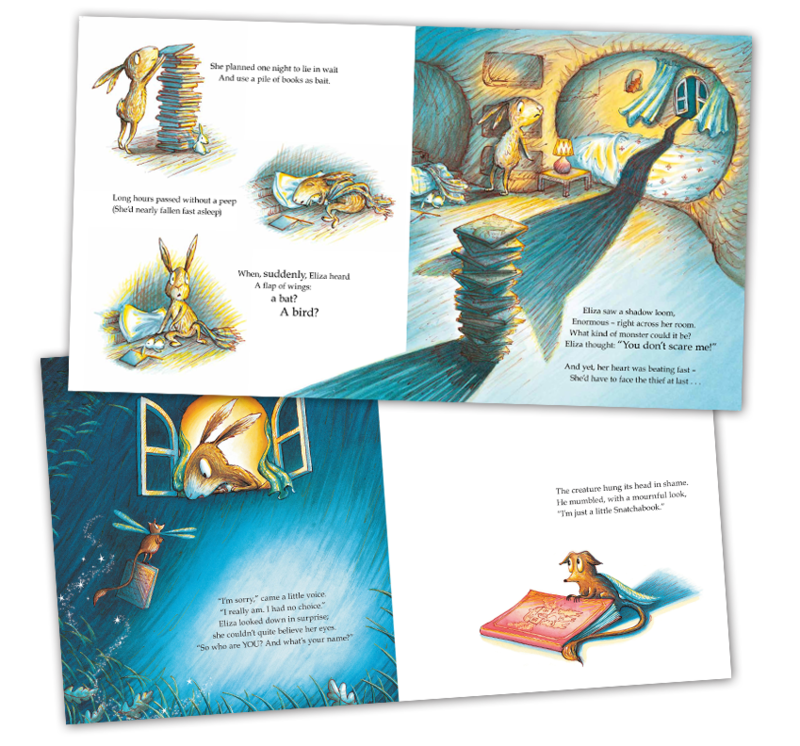 Sample interior artwork from The Snatchabook by Helen Docherty with illustrations by Thomas Docherty from Sourcebooks/Jabberwocky 2013. Hovering just outside the window is a small, rodent-like creature with dragonfly wings, a long skinny tale and large, lonely eyes appealing to Eliza for forgiveness, “I’m just a little Snatchabook.” Snatchabook didn’t mean to swipe all the books, he explains to Eliza. He simply had no one to read them to him. 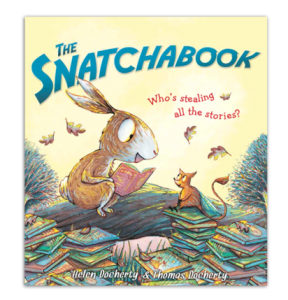 In a wonderfully satisfying ending, H. Docherty has Eliza teaming up with the Snatchabook to right his wrongs, return all the books while finding a few good bedtime story readers to feed his imagination and soul. Coming to bookstores this October is a really terrific retelling of a most beloved fairy tale, Cinderella, this time starring none other than the perfectly plump and pleasing pachyderm known as Cinderelephant (Arthur A. Levine Books/Scholastic, $16.99, ages 4-8) written and illustrated by Emma Dodd. Parents, it’s likely that by the time you read this to your child, he or she will have already heard this classic or watched the Disney version. That’s definitely a plus because it will allow you more time to spend pointing out all the humorous touches Dodd’s included in the colorful and cheerful illustrations. And if your youngsters are new to the tale, they’re still in for a tremendous treat. You know the plot and to Dodd’s credit, her economy of words keeps the story fun and flowing for those of us for whom the tale is not new. Cinderelephant is bossed around by the Warty Sisters, two unattractive Wart Hogs who are “horrible, mean, and smelly,” plus they clearly lack table manners. When an invitation to Prince Trunky’s ball arrives, young readers get their first clue as to what this Prince might look like considering the king is called King Saggy and the queen is Queen Wrinkly. Calling her “Cinder-irrelavant,” the Warty Sisters slough off Cinderelephant’s hope of also attending the ball. I love how Dodd features a Furry Godmouse who’ll save the day and get the gigantic gray gal to the Prince’s party. She even manages those appropriately placed superlatives and the occasional big but (you’ll see what I mean) joke with both her text and artwork. Parents and kids will be entertained by the humor, whimsical illustrations and happy ending (pun intended) because, let’s face it, we all know one pink size 20+ shoe can only belong to one palatially-sized pachyderm! Where Do Lost Stuffed Animals and Baby Blankets Go? Read on to find out! Blanket & Bear, A Remarkable Pair (G. P. Putnam’s Sons, $16.99, ages 3 and up), the debut picture book from L.J.R. Kelly (grandson of Roald Dahl) with illustrations by Yoko Tanaka, is an ideal parents’ go-to book when beloved toys get lost. Some parents buy two of everything just-in-case, others spend hours retracing their steps or making frantic phone calls in an attempt to locate a lost teddy or blanky. But here’s another option. Read this picture book to your distraught youngster and it’s likely they’ll find solace in this charming story with its muted artwork harkening back to a time when men wore hats, women wore dresses and people traveled abroad by steamship. Parents may find Tanaka’s illustrations a bit sombre in the beginning, but I found that as the story’s mood changed, so did the feeling conveyed in each picture. Stick with this story as it tugs at the heartstrings and is sure to start a meaningful conversation with your child. With an original voice very different from that of his grandfather, Kelly is a terrific storyteller in his own right. The premise is quite a simple one in that when a young boy loses his beloved blanky and teddy, he carries on with his life. The focus is not on how he copes with the loss. Quite the contrary. Kelly chooses to show how the boy’s cherished possessions, spend their time searching for the boy, hoping to be reunited. Instead, they arrive “at an island of lost blankets and bears, living in retirement without worries or cares. It’s here they sadly learn from the island’s king that they’ve likely been replaced. Unable to accept this possibility, they depart and resume their quest. When at last they find the boy, he’s a young lad more interested in sport and girls. No longer needed, they’re free to return to the island and join the other lost or abandoned blankets and bears. Children hearing this story read to them or reading it with the help of a parent, will likely want to discuss this new take on “they all lived happily ever after,” because in this case the book’s characters did not end up living happily ever after together, but there’s no denying they were all happy in the end. NOTE: This review was originally posted on Jan. 17, 2012, but we felt it was fitting to repost to mark the 50th anniversary of MLK’s March on Washington. My Uncle Martin’s Words for America is a wonderful summary of the highlights of this extraordinary leader’s journey to promote justice, freedom and equality for all Americans. Young readers are introduced to segregation, Jim Crow laws, King’s incarceration, protests, speeches and the events the led up to the Civil Rights Act of 1964. In the back of the book you’ll find an excellent chart summarizing the protests MLK led, matched with the resulting changes in civil rights. There’s also a helpful glossary. I respect the fact that this book does not focus on the assassination, but rather on his philosophies and accomplishments. I have read and reviewed countless children’s picture books, and only a few of them really stand out as momentous as far as the quality of the illustrations; this book is indeed one of them. To simply say that the Coretta Scott King award-winning illustrator, Eric Velasquez, is extremely talented is just not enough. Not often does one come across illustrations so realistic, vibrant and beautiful as these. He paints with oils on watercolor paper, and it is a glorious combination. Just take a look at the jacket cover – front and back – and you’ll have no choice but to open this book and take it all in. It’s obvious that Eric Velasquez has a calling in life, and he answers that call each every time he paints a picture. Oh how I’d love to have one of his paintings on my wall at home! Read my interview with illustrator Eric Velasquez. This book is reviewed by Debbie Glade. P.S. As I wrote this review, there was a woman on my local news station at an MLK parade in Miami being interviewed about this holiday. She said, “What Martin Luther King, Jr. did was not just for black people, but for all people.” I could not have summed up his achievements any better than that. 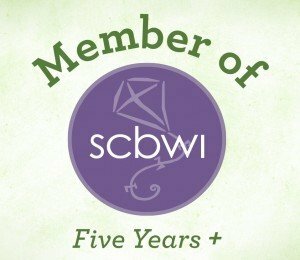 Reading Dogs and Writing Snakes You Say? In a picture book, any scenario you can imagine – and even those beyond your wildest dreams – can come to life. In What the Snakes Wrote ($9.95, Firefly Books, Ages 5-8), a farm dog named Rufus befriends a big family of snakes that slither and arrange themselves into letters and words to send messages. 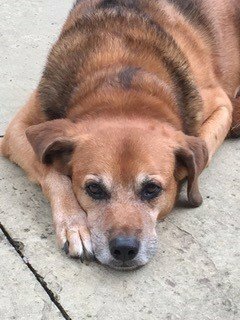 Rufus, being the friendly, helpful canine that he is, runs to the rescue of the snakes as they post different messages calling for help. He even tries to get the attention of the farmer when the snakes need more assistance than he alone can give. But the farmer is busy and just doesn’t notice what’s going on. When the snakes are in real deep trouble, will Rufus be able to save the day? The story, by author Hazel Hutchins, is original and the message is one of literacy. I like the fact that even though the story is not reality (i.e. snakes cannot write and dogs cannot read) in the back of the book the author provides two pages of interesting true facts about snakes. The cheerful illustrations are cartoon-like, and I love the way illustrator Tina Holdcroft depicts the snakes as they form words. Reading What the Snakes Wrote with your children, is the perfect time to broach the subject of the importance of being able to read and communicate. It also opens the door to further exploration of the fascinating world of snakes. And it is just a really cute story. Inside My Imagination ($15.95, Cuento de Luz, Age 5-7) by Marta Arteaga is a captivating book about a girl who enters a magical paradise, all created by her own imagination. 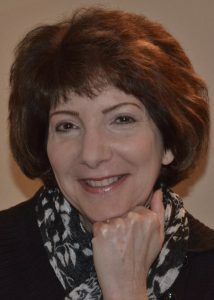 She “breathes in a story” while taking young readers through her mind and ever-changing random thoughts. Her visions are enchanting, and she tells us how they flow together making her more and more creative and giving her more and more original ideas. The hardcover book is of the highest quality, and the delightful illustrations by Zuzanna Celej are misty and imaginative, perfectly fitting for the somewhat poetic prose. The true beauty of Inside My Imagination is that it encourages readers to think outside the box. It lets them know that it is perfectly okay to use their imaginations, and in fact is a wonderful thing to do. It can take them to never before explored places and send them on a path of discovery of new ideas. More importantly, it teaches them that their imagination is what gives them the freedom to be themselves. One Gorilla: A Counting Book ($16.99, Candlewick Press, Ages 3-5) is simple, just like a counting book for wee ones should be. But it is also wonderful because the illustrations are extraordinary. Author/illustrator Anthony Browne, a recent Children’s Laureate in Great Britain, has penned and illustrated more than 40 books! His attention to detail makes these pictures worth lingering over for a really long time. The book features 10 different primates, plus has a little bit of a clever ending. From the book jacket, colorful inside front and back covers to each and every page, it is a visual wonderland. Your little ones are sure to be motivated to learn how to count after reading One Gorilla. It may also invite you to open an initial discussion about evolution, if you so choose to do so. Feeding time at the Miami Zoo sure is entertaining. Look closely: this big guy has an orange in his mouth. I appreciate author/illustrator Michael Townsend’s sense of humor. How many picture books do you see with wording on the jacket cover like the latest mouthwash or detergent only funnier? Now with added CUTENESS! The language Townsend uses throughout the story will totally appeal to today’s youngsters who would absolutely name their own new puppy Sir Yips-a-lot just like Janie Jane does. The new pet and owner spend 24/7 together year round until Janie Jane’s next birthday when she receives a new kitty. Suddenly, no longer the cutest pet in the world, Sir Yips-a-lot must take a back seat to Lady Meow-meow, “The World’s Cutest Kitty!” according to Janie Jane. Watching Sir Yips-a-lot try to win back Janie Jane’s attention is hysterical and his realization that he is jealous will surely be a conversation starter for many families. But my favorite part was the page devoted to Sir Yips-a-lot’s schemes to rid the world of his competition as he launches OPERATION CUTE-BE-GONE!! Things backfire, however, when the puppy feels guilty about his awful deed and is determined to find Lady Meow-meow. Townsend’s plotting is perfect and he wraps things up or maybe I should say unwraps things (see for yourself) with a happy ending that makes CUTE & CUTER ideal both for story time or for bedtime. TCFW!! More and more it seems that stories of fires, tornadoes, hurricanes and floods tug at our heart strings. How do we explain these disasters to our young children? Capstone came up with a most creative and unusual way. Flood ($15.95, Capstone: Picture Window Books, Ages 6-8) took a bold approach and created a book with no words, rather with incredibly detailed and impressive illustrations by Alvaro Fernandez Villa. These pictures tell the full story of a family of four that must flee their home before a major flood destroys it. Capstone is making a substantial donation from the sale of Flood to the non-profit organization, Save the Children. The money raised will be used for the Domestic Emergency Relief Fund which provides food, health care and education to families with children following natural disasters. As parents, we want to protect our children from pain and despair, yet this is not always possible. This book was created with that purpose in mind; it helps young children understand and deal with natural disasters, teaching them the inevitable lesson that some life events are unfortunately out of our control. The wordless narrative allows parents to open up discussions about what the family in the book is experiencing. Capstone provides an excellent Flood Reader’s Guide containing general information about floods and tips on “reading” a wordless book – before reading, while reading and after reading the book. It’s all in studying the details of the illustrations and asking children what they see and how the family must be feeling while fleeing their home. There are even suggestions about acting out the story or posing as a reporter. Flood covers the gamut of so many emotions – hope, fear, despair, sadness and eventually gratitude. It gives children and parents a chance to express themselves without the fear of being judged. I admire Capstone for taking the risk to broach such a sensitive and unpleasant subject for young children – and oh, how well they do so. I also love the fact that this book will inspire children to think in ways they may never have before. They will look at the illustrations and use their own judgment to determine what is taking place. And I must add here that these are some of the best illustrations I’ve seen in a picture book. When you finish “reading” Flood with your children, you are left with the powerful message of hope. And, as I mentioned earlier, when you buy the book, Capstone donates a portion to Save the Children, leaving others in need also with hope. 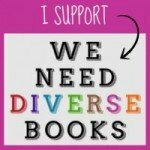 Our family has been enjoying Barefoot Books for many years mostly because of their diversity, quality and beautiful illustrations. All you have to do is check out their website here and you’ll see what I mean. 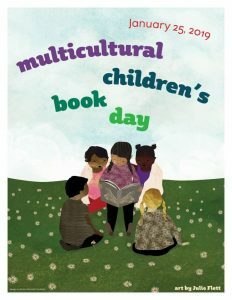 There are bilingual books, independent reader books, stories from around the world, games and more. It’s not hard to find yourself wanting everything. However today I’m reviewing a version of A Hole in the Bottom of the Sea (Barefoot Books, $16.99, hardcover with enhanced CD; $9.99, paperback with Enhanced CD, $6.99, paperback only, ages 3-6), adapted by Jessica Law with artwork by Jill McDonald and sung by The Flannery Brothers. This classic cumulative song is perfect for print and features creatures such as a shark, an eel, a squid, a crab, a snail and a weed thus introducing nature’s food chain to youngsters in a fun, gentle way. And kids will enjoy pointing out the eel and all the others as they each try to hide from their respective predator. “There’s an eel and a shark in the hole in the bottom of the sea. He’s concealed from the shark in the hole in the bottom of the sea. The book works on many levels in that it’s repetitive and sing-songy, there’s a page with numbers where the creatures are counted, all with easy to read text. McDonald’s engaging art is created using textured and painted papers that are then assembled digitally with a bold and vibrant outcome sure to please. The helpful end pages contain loads of info on the blue holes found in the bottom of sea, the food chain, and the creatures who call the ocean their home. Plus there are words and music included to play with an instrument not to mention the CD containing video animation and audio singalong. When you purchase a Barefoot Book you are helping the planet as they only use paper from sustainably managed forests. 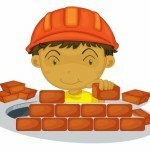 “Playful, beautiful and created to last a lifetime, our products combine the best of the present with the best of the past to educate our children as the caretakers of tomorrow.” That’s a credo to admire in this day and age of over-packaged goods, and non-environmentally friendly products. Bad Astrid ($15.99, Random House, Ages 3-7) by Eileen Brennan is a charming book for young readers about an age old problem – bullying. Astrid is a bad girl dog who wreaks havoc when she moves into a new neighborhood. The story is told by another child dog (that looks a bit like a beagle) who finds herself in Astrid’s destructive path. Astrid destroys gardens, sprays water on chalk drawings and is just all around grumpy, nasty and mean. One day the beagle makes a great big Eiffel Tower out of Popsicle sticks, but Astrid crashes into it with her bike. Naturally the beagle’s first reaction is anger, but soon she is able to see Astrid for who she really is. What she does will warm your child’s heart. The book is written in rhyming prose and is rather catchy and cute. I love the cartoon-like illustrations by Regan Dunnick as they really capture the emotions of the dogs. It’s the message of this book that makes it most special – behind every trouble maker is an individual with some good qualities too. Reading this terrific book is a great way to start a conversation with your child about being bullied and about keeping an open mind to help find out the truth about another in need.